Monday is Election Day in Canada! Past archbishops have involved themselves in politics to varying degrees. Archbishop John Lynch was often thrust into the public limelight when it came to furthering the well-being of his Church and fellow Irish Catholics. His episcopacy (1860-1888) saw the Confederation of Canada, as well as growing tensions between Catholics and Protestants. Voter turnout during the 1880s was steady at just over 70%. The 2011 federal election had a turnout of 61.4%, which followed an all-time low of 58.8% in 2008.
provincial election, Archbishop Lynch told Catholics, "The battle is to [be] fought at the polls. - Those who do not go, fail in their duty to themselves and their children." Similarly, the 2015 Federal Election Guide, published by the Canadian Conference of Catholic Bishops, urges that "Canadian Catholics are being called upon as citizens to exercise their right to vote." Voting is a right and responsibility, so do your duty on Monday! 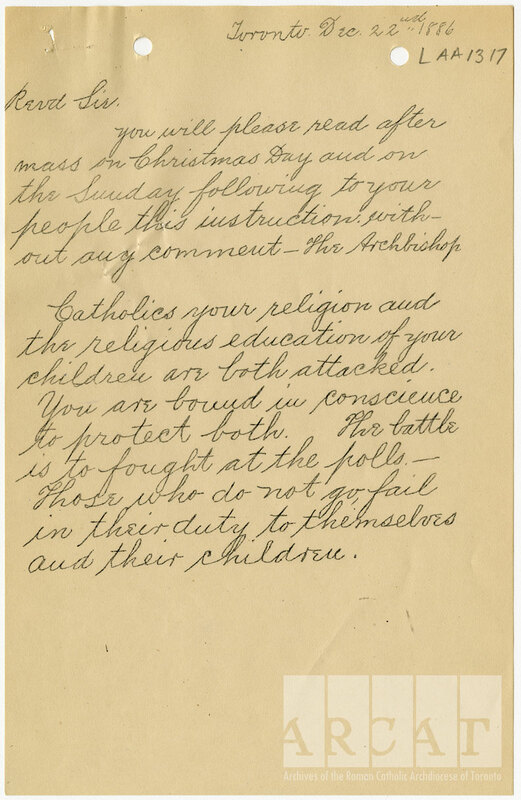 "Catholics your religion and religious education of your children are both attacked. You are bound in conscience to protect both. The battle is to [be] fought at the polls. - Those who do not go, fail in their duty to themselves and their children."